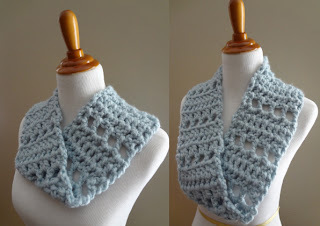 Click here for the Cloudy Sky Mobius Cowl pattern! Here is a more detailed photo tutorial on making the twist, or mobius part of the pattern, I thought it would be good to add a little more directions and how-to photos in case you needed them. This is also a great tutorial for transforming any scarf you already have into a mobius too! Here is how it looks now...it looks like a big "V"
Now fold the sides in as shown. See where the needle is pointing in the picture below? That is where we'll stitch it up. Now whip stitch it up so it will lay nice and flat. All finished! Easy as pie, and makes a lovely cold weather accessory. Love this pattern!! Can't wait to make it myself!! Thanks!! Yay! Have fun and you're so welcome! I made this today for a charity auction. My mom liked it so much, she asked me to make her one and I'm definitely making myself one! A very quick and easy pattern, thank you for sharing, I love it! Love this tutorial Jennifer - have just put a mobius twist in a length of trebles and half trebles and made a fab cowl that sits flat! Thank you so much for all the inspiration on your blog - is packed with great ideas! This is going to sound odd but I made one to fit my daughters old dog he freezes. I made it long enough to wrap around once to cover ears and neck. He loved it.